God made the angels to show Him splendor, as He made animals for innocence and plants for their simplicity. But Man He made to serve Him wittily, in the tangle of his mind. Seven Quick Takes while I let my child rot in her crib, because it’s naptime darnit! It’s Friday already? Shoot! Let’s see how fast I can do 7 Quick Takes. 1. 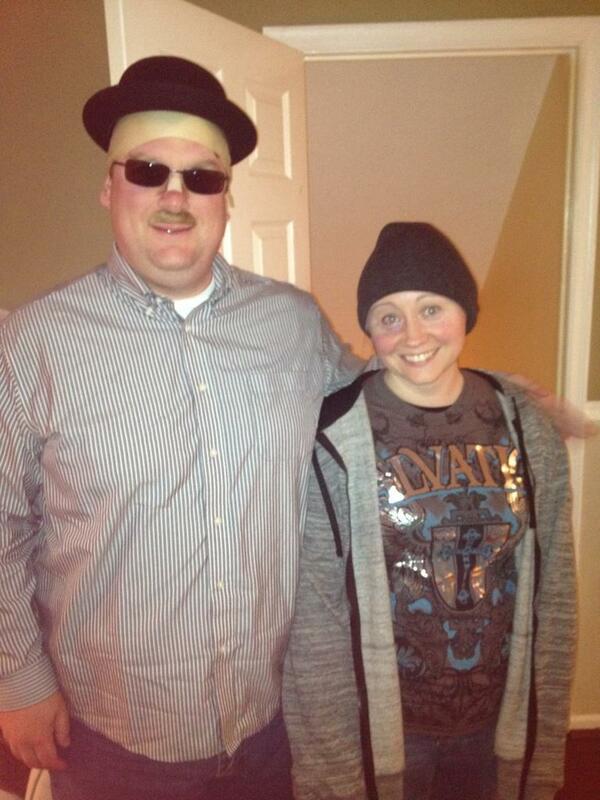 My husband and I went to our first grown-up Halloween party since college. Can you guess who we were? It didn’t show up well in the pic, but I worked very, very hard at giving myself a realistic black eye. I watched youtube videos and everything. 3. I know God doesn’t really operate that way. Still….aaaaurgh! 4. I love Jen’s Conversion Diary blog for so many reasons, but this one really hit me last weekend: It is such a relief to realize that getting overwhelmed by life and coping by ignoring it is, like, a thing and not just an indicator that I am a bad person. Case in point: my daughter’s friend spent the night here last weekend, and when her father came to pick her up he knocked on the wrong door. We have two doors leading into our house: one is in the front, facing the road and looking pretty front-door-ish. This door is broken. The second door is on the side, past the lean-to that should house our garbage, only pulling the cans in and out is a pain, so we just leave them laying around. Also, we forget recycling-day all the time, so our recycling can is usually overflowing into multiple cardboard boxes set around it. The boxes are generally soggy and half-deteriorated. This door works. I can’t say I blame the Dad for picking the wrong one. To unfasten the broken door, I have to unlock it, unchain it, and then pull with all my might until it opens enough that I can wriggle my hand inside and unhook the bungee cords we use to keep the screen door from banging in the wind. It takes a solid minute, but when you are staring through the glass at someone who is gaping in shock and disbelief at you, it feels much longer. 5. Back to Jen: I wish I had her ability to come across as charming and eclectic in situations like this. Unfortunately I’m pretty sure I just seem weird and shiftless. 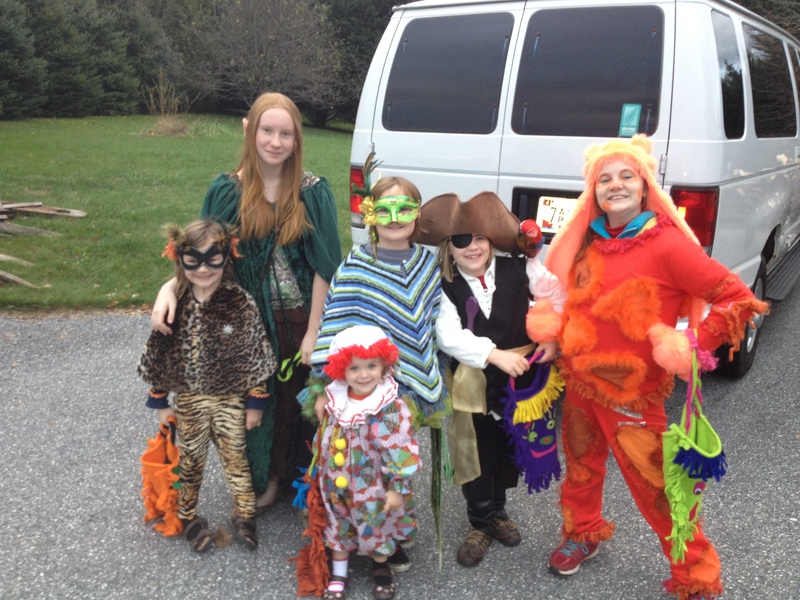 A lioness, an elf maiden, a woodland fairy, a pirate, an orange monster (do you know how hard that is to pull off when you don’t know how to sew???) and an adorable clown. 7. None of these quick takes has anything to do with the purported aim of this blog, but my toddler is not napping. I don’t see how I can be expected to put thought into stuff under the circumstances.. This entry was posted in life and tagged angst, breaking bad, my insane progeny, seven quick takes. Bookmark the permalink. Me! Me! It’s all about me! Rebecca Mlinek is a Catholic mother of six and a serious bookworm. You might think *you* are a bookworm, but she is SERIOUS. She finds the time to read by doing it when she should be folding laundry. Follow In The Tangle through email! Yippee!